I love fabric. I love buying fabric. I love organizing my stash of fabric. I love talking about fabric, educating myself about fabric, and admiring my fabric. 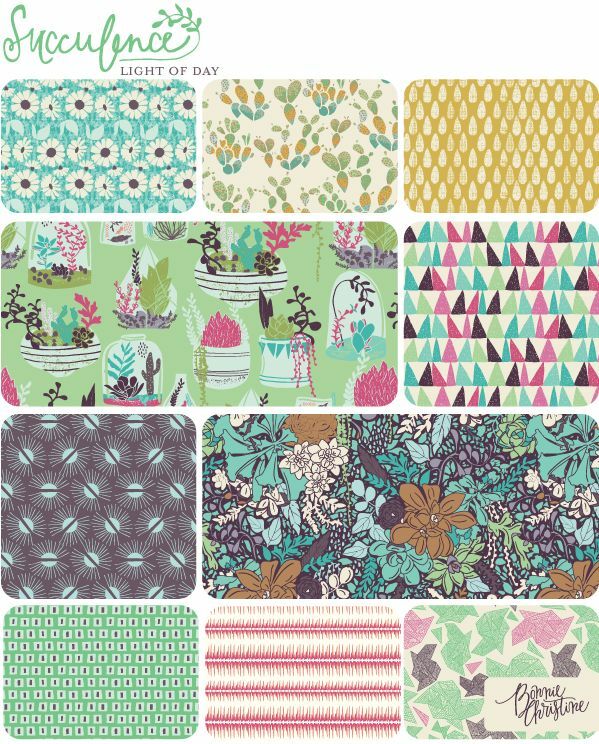 for 11 fat quarters at Massdrop! Back in November, I was at my parents’ house for the first time since I’ve begun quilting. My mom was looking for some jelly rolls that she had bought and wanted to show me, so I went on the search with her. My mom discovered the jelly rolls. I discovered that I own more fabric than she does. Bah! What had me disillusioned for so long was her method of organizing her fabric. As a more traditional quilter, she buys fabric that coordinates. She often has a pattern in mind when she makes a purchase, and different cuts that will be used for the same project live together in one of her storage spots. 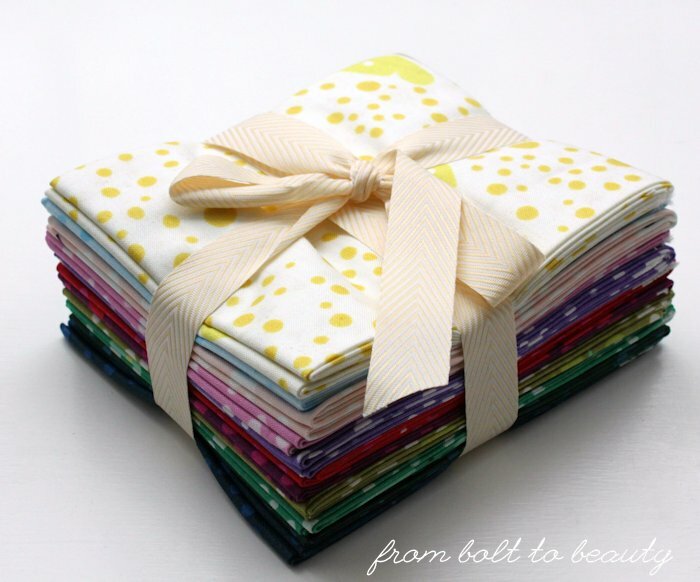 As a more modern quilter, I buy fabric because I like it, because I know it has potential in a future project of mine. And my fabric primarily lives in a dresser in my guest room—all the colors and different designs cohabitate. Clearly, my mom isn’t the only one with a problem; I need a solution to curb my fabric-stashing tendencies. Then an opportunity presented itself, one for which I could buy fabric for other people. I recently took on a board position with my guild. I research speakers and workshops, schedule some cool stuff for my fellow guild members, and handle the logistics for those events. 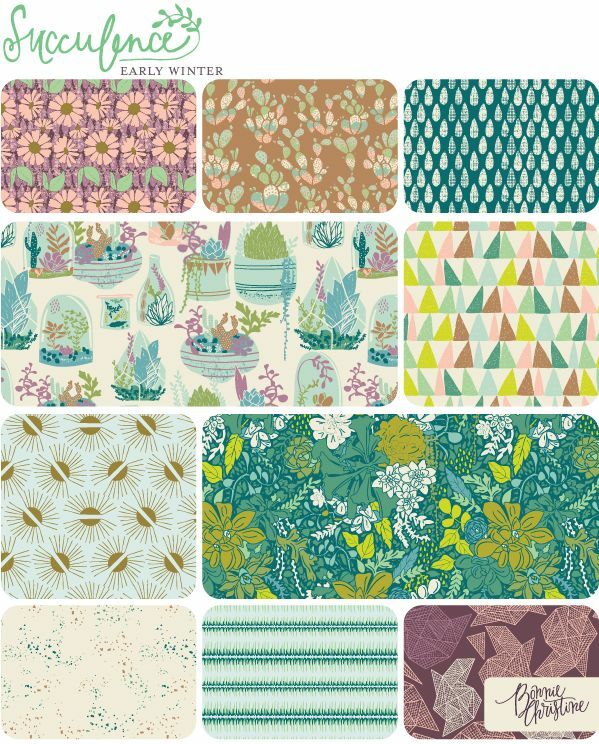 I also get to buy fabric—I’m in the fabric-buying game without adding to my stash! 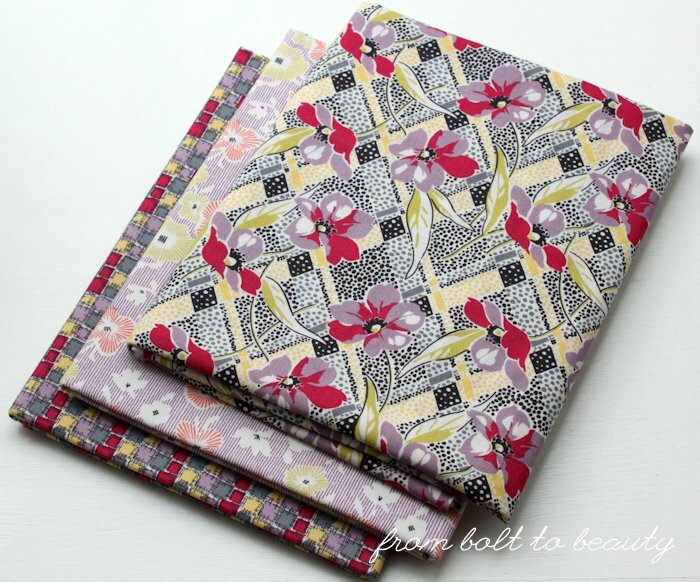 on clearance for $5.38 per yard at the Fat Quarter Shop. Amy Sinbaldi. I bought them all at 30 percent off. Woo hoo! Sigh. Nunchucks are a martial arts weapon. I’m pretty sure I didn’t know what they were when I was 7 (or 27, for that matter). 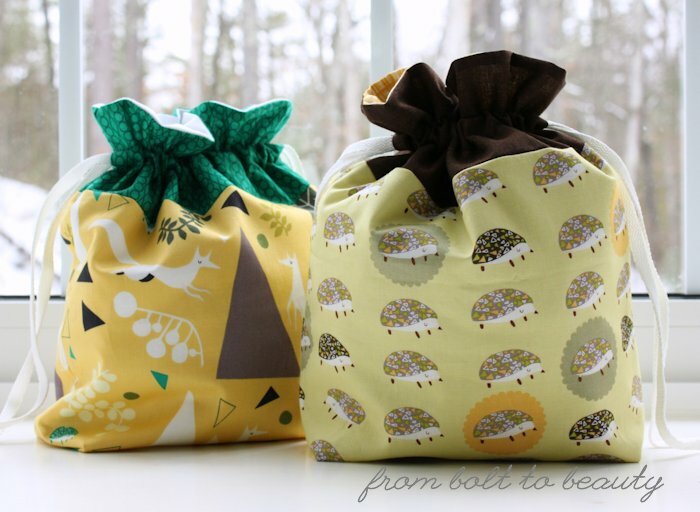 I used a well-loved tutorial: the Lined Drawstring Bag Tutorial from In Color Order. It had been on my must-sew list for years, so I was happy to give it a try. Everything you’ve read about it is true: It’s an easy, well-written (free!) pattern. 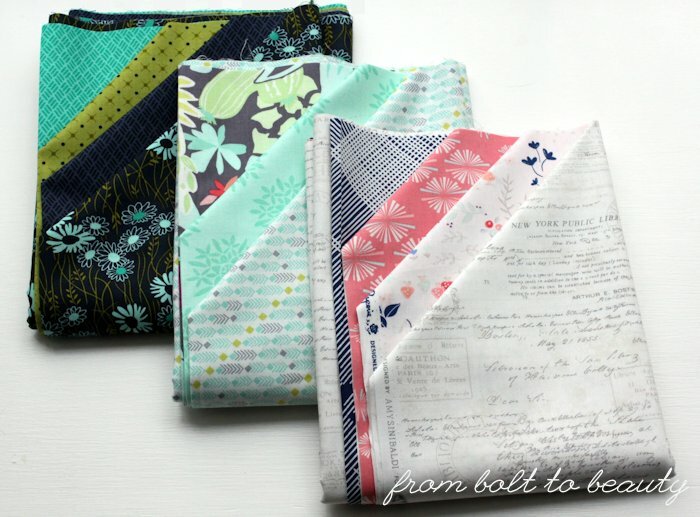 In the samples designer Jeni Baker made for her tutorial, she used all sorts of cute things as the drawstring, like measuring tape ribbon and handmade fabric ties. I used not-so-cute shoelaces because, as I’ve mentioned, my boys are hard on everything—including their clothes, my house, and me (my injuries speak for themselves! )—and the laces are the most durable thing I can think to use. To be honest, there is a lot of crafting going on by little hands at my house. 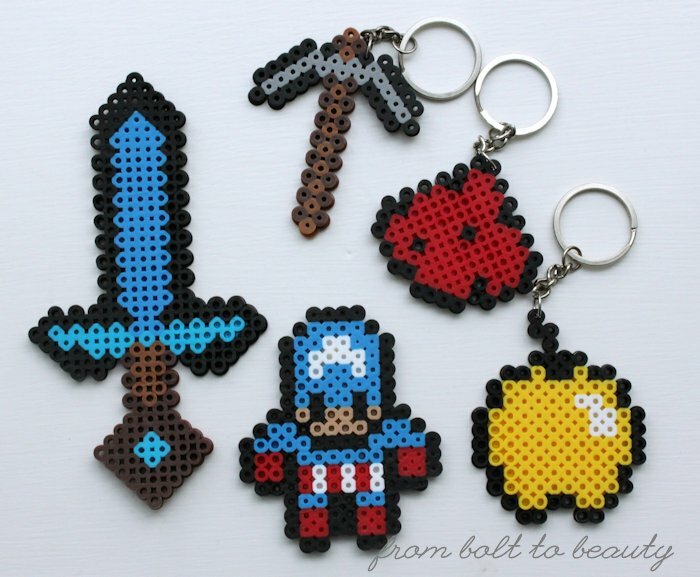 Oh, look: these Minecraft-inspired Perler Bead projects include weapons. How about you? 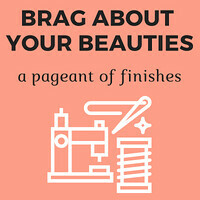 What have you had success with in your own drawstring bags? Do you have a go-to ribbon? Hmmm ... and if so, do you use Fray Check on the ends? As for me, I’ve also used faux leather cord, but it wasn’t as malleable as I’d like. I am open to suggestions! To readers old and new, welcome! You’ve arrived at the day’s stop on Bonnie Christine’s Succulence Blog Tour. 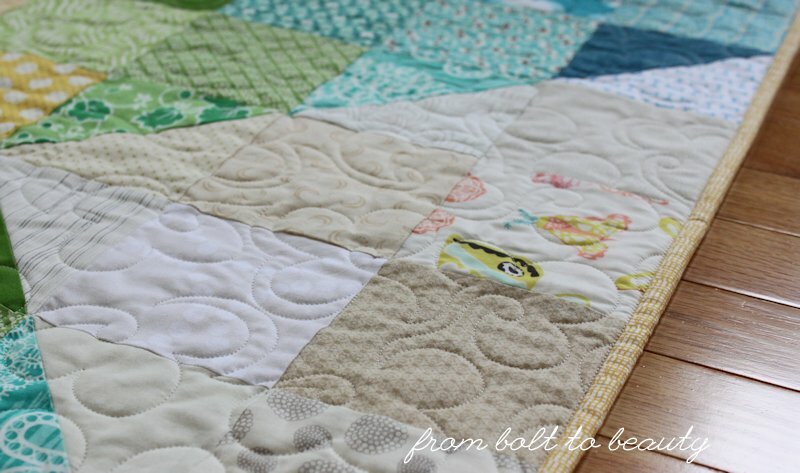 If you’ve visited before, you know that I’m a quilter, and I rarely need an excuse to make a quilt. If there’s a new baby in my life, I make a quilt. If a friend is sick/sad/otherwise not feeling like herself, I make a quilt. 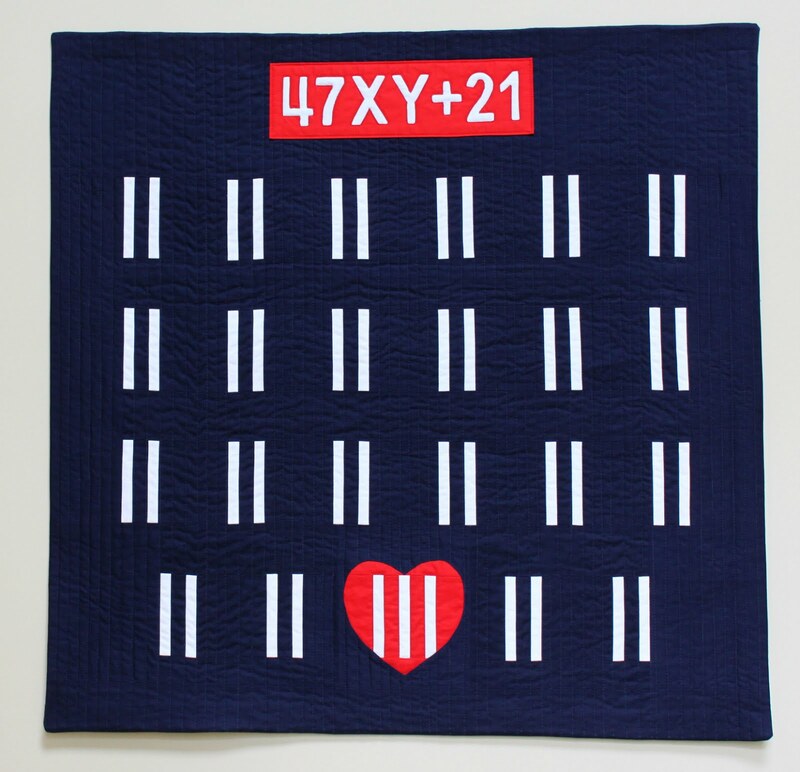 If I want to deliver a handmade birthday/Christmas/Flag Day gift, I make a quilt. 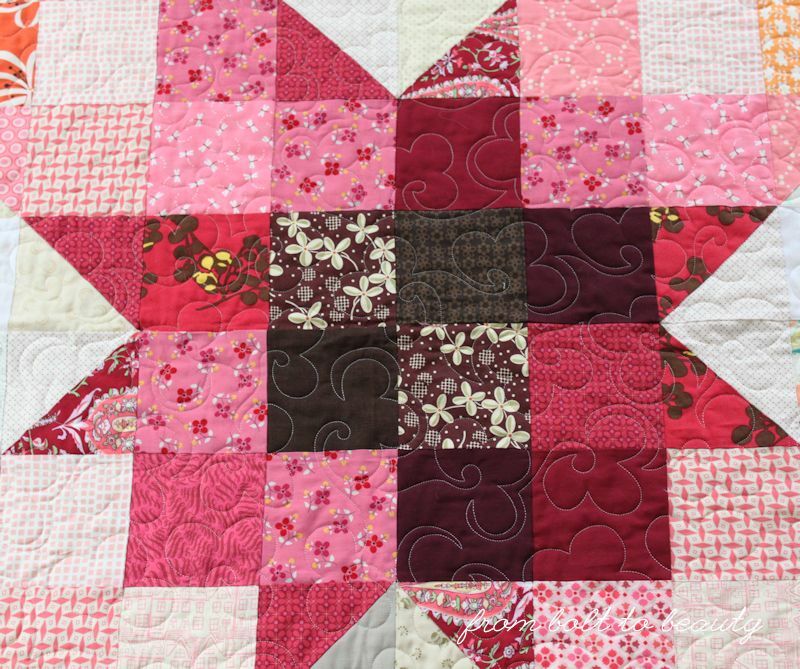 Here’s the thing: Quilts, even simple ones, take a long time to make. 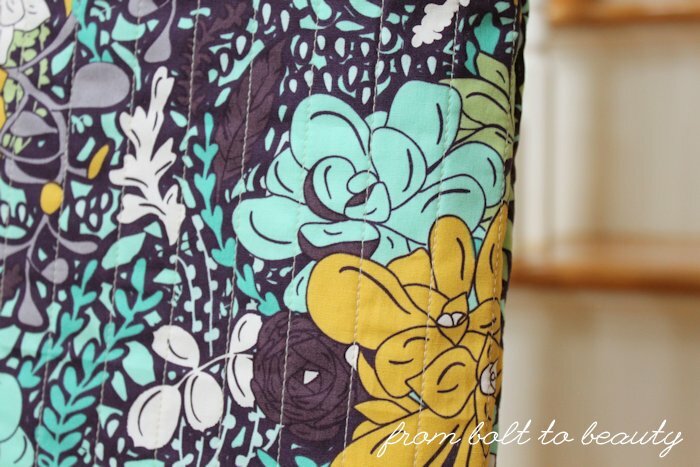 So aren’t you surprised—maybe even a little proud—that I listened to my inner voice of reason and, when given the opportunity to work with Bonnie Christine’s Succulence fabrics, sewed a bag? quilt sandwich through my domestic machine! This is Rosette in Fireside. So. Darn. Pretty. It comes in another colorway, shown here at Taylor Made. I chose this colorway, however, for the beautiful raisin color. It reminds me of a hue in Bonnie’s Winged line, which I have also had the pleasure of creating with. What else can I tell you about this project? 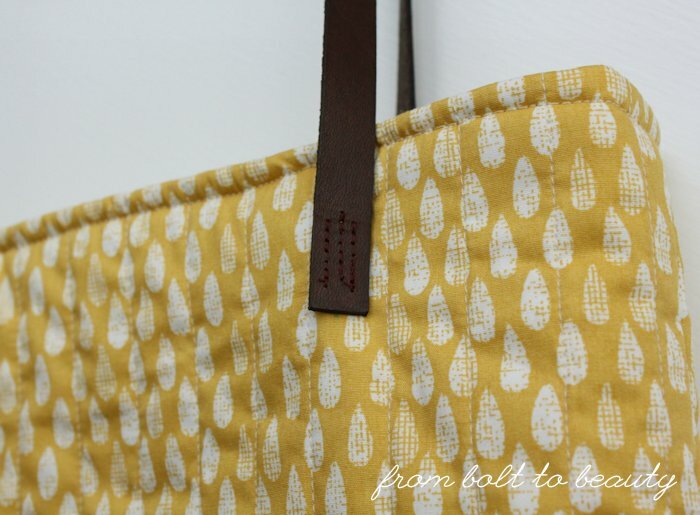 The pattern is from Stitched in Color’s Color Intensive course, and it’s the first time I’ve sewed leather straps on a bag. The result was a faster and cleaner-looking finish than when I make my own fabric handles. I’m giving this bag to a friend; I’ll have to ask her how they hold up over time. the handles on. I pray they hold up! 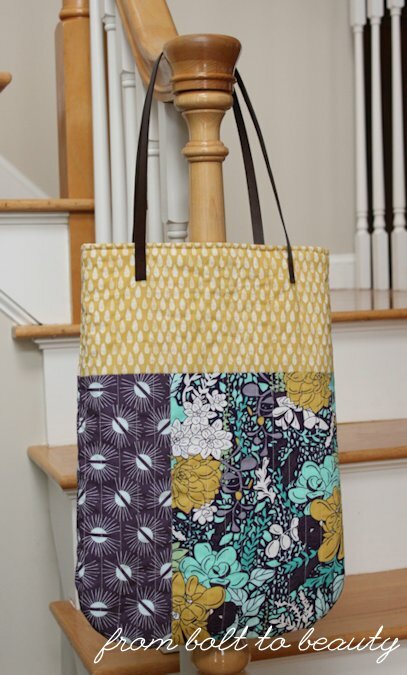 I’m also fond of the rounded corners at the bottom of the bag, which make this project my entry into this month’s Le Challenge (the theme is round). 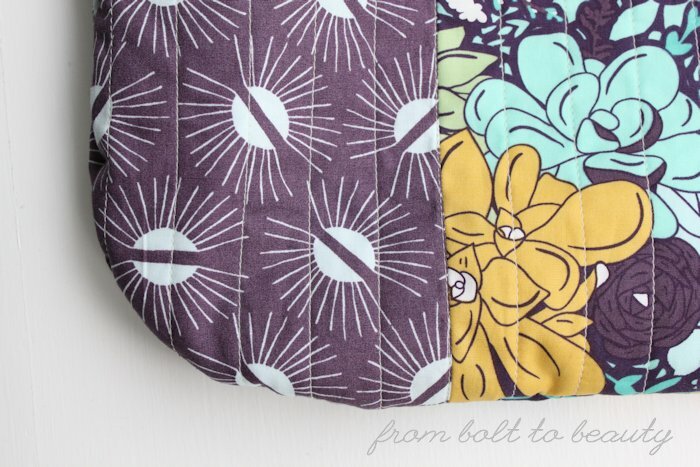 Truth be told, I did design a quilt for this fabric line. It has been mocked up in EQ7 and is ready to go. Will I have the time to tackle it? We’ll see. If I do, you’ll be the first to know. 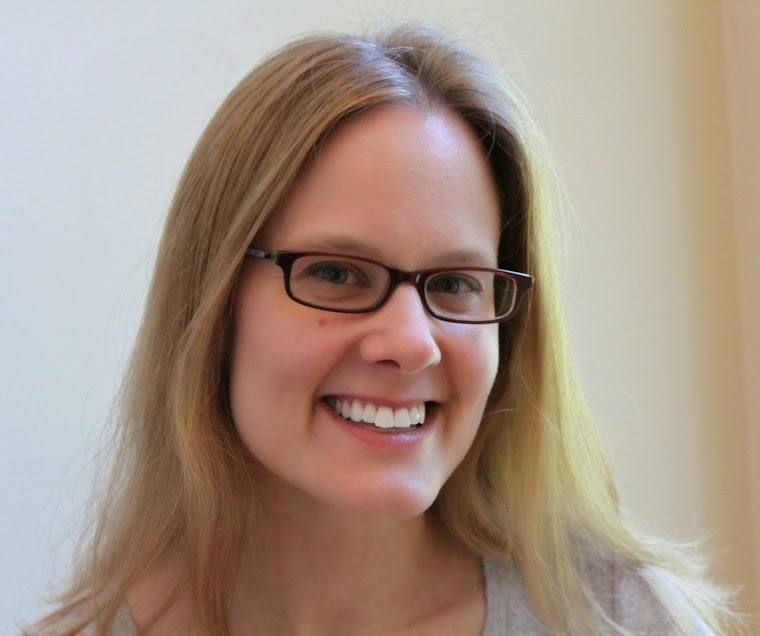 Friday, February 12th: Sarah Bertochi | Sarah B. Check out the coolio quilting. I got to use so many low-volumes in this project. The whole (huge!) thing was trimmed in this mustardy net print from Dear Stella. 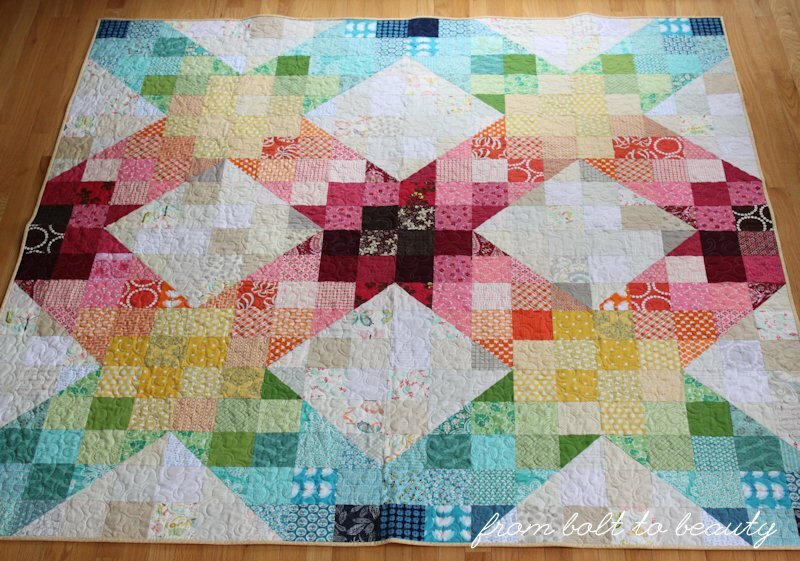 So I have another scrap quilt in the works for March, but you and I both know that one quilt will not clean out that bin. Do you have a suggestion for another scrappy design? I have a copy of Alexandra Ledgerwood’s Improvising Tradition and am thinking of using her piecing method to do something scrappy. What do you think? 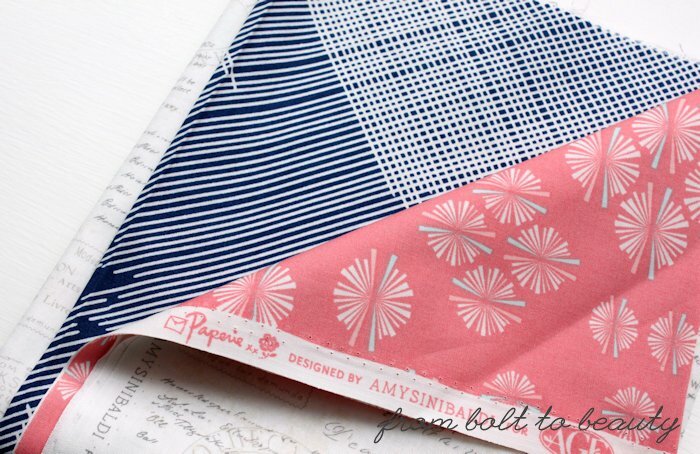 Can you imagine a scrappier version of Paper and Plums in cool purples, blues, and greens? 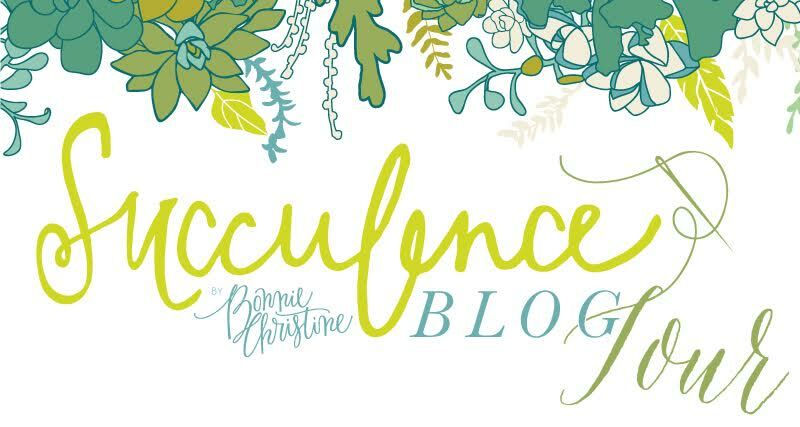 I’m excited to announce the Succulence Blog Tour. 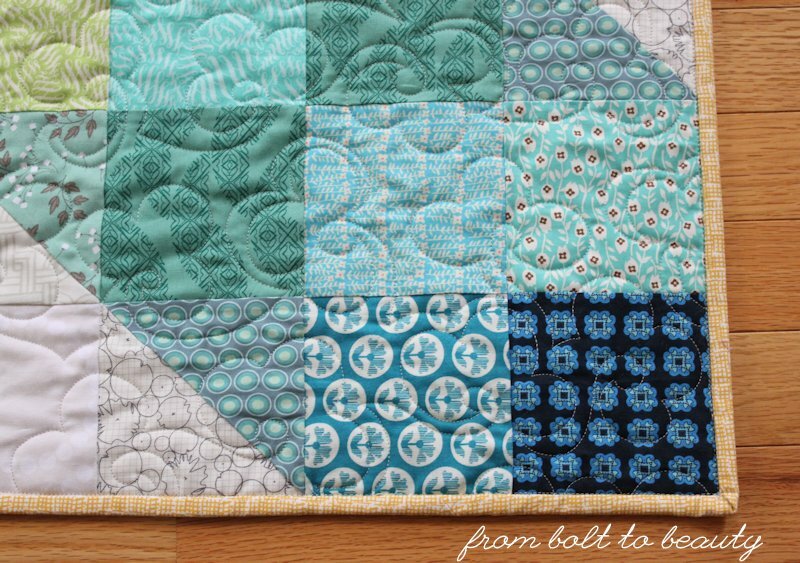 This event, which debuts today, features the work of 16 bloggers and their creations with Bonnie Christine’s Succulence fabric line for Art Gallery Fabrics. 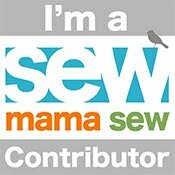 I have a pile of Succulence on my sewing table now, and I look forward to revealing my project on February 17, my day on the blog tour. Until then, visit Bonnie’s blog, Going Home to Roost, to see what the other participants have created!